Ebola. Chikungunya. Dengue. Norovirus. Hantavirus. Swine flu. Varicella. Variola. The names sound like something out of a Sci-Fi movie. Yet, threats to Americans are real, and escalating by the week. The Department of Homeland Security (DHS) reported on August 1 that serious diseases are spreading at detention centers for Illegal border crossers. Health care workers and Border Patrol agents, plus their children, have tested positive for tuberculosis (TB), swine flu, chicken pox, lice and scabies. Instead of being quarantined, illegal border crossers are being dispersed rapidly across the U.S., with those of school age being registered in public schools opening soon for all. Multiple-drug resistant TB (MDR-TB) is spreading in India and Pakistan. Illegals from those countries have been identified coming across our southern borders. July 23, China announced it had sealed off the city of Yumen due to a deadly outbreak of bubonic plague. Chinese are so numerous in the current surge of illegals that the federal government has added Mandarin translations to emergency signs across the Texas border regions. Mexico has serious outbreaks of dengue fever, which can produce debilitating physical and neurological effects, and also has more severe and deadly hemorrhagic forms. 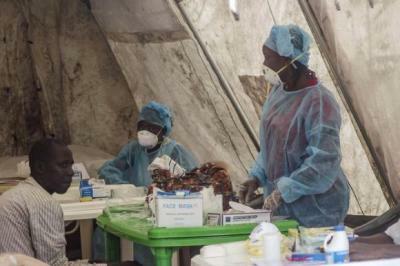 Deadly Ebola hemorrhagic fever is raging out of control in multiple countries in West Africa. Border Patrol agents confirmed that West Africans have been apprehended coming via Mexico into the Rio Grande Valley in Texas, with a number of seriously ill individuals whisked away to undisclosed locations for treatment of undisclosed illnesses. ABC News reported in mid-July that seriously ill illegals were flown from Texas to Ventura Naval base recently with high fever, respiratory difficulties, and coughing blood. At least three required ICU admission. No information was released on what illness was diagnosed, but the time course, severity of symptoms, and need for immediate ICU treatment is not typical for tuberculosis and more consistent with Ebola or hemorrhagic forms of dengue fever. Ebola is one of the most lethal diseases we face, with a death rate from 60-90 percent of infected patients. It is a horrible death as the virus attacks the blood vessels leading to hemorrhaging internally and externally. There are no good treatments or vaccines. Ebola's use as a weapon of terror and mass destruction has been documented by GlobalSecurity.org, which reports that the former Soviet Union biological weapons program had weaponized the Ebola virus, and that Aum Shinrikyo, the Japanese terror group, recently sent members to Africa to harvest the virus during an outbreak. After long neglecting the contagious disease issues that arose in early June, On July 31, ABC, NBC, CBS and other news outlets simultaneously reported the arrival of two Ebola patients from Africa. Does this give "plausible deniability" to the possible role of illegal border-crossers in bringing Ebola to the U.S.? Not very contagious? Really? Then why do World Health Organization (WHO) officials say the "worst on record" Ebola outbreak in three countries in West Africa is spreading out of control? Why all the special haz-mat suits for doctors and nurses? Why did two doctors die treating Ebola patients? Why all the special and expensive isolation units for Ebola patients? In sharp contrast to WHO, US Centers for Disease Control (CDC) and government spokespersons seem to be going out of their way to downplay risks to Americans. Dr. Richard Besser, a former acting director of CDC during the swine flu outbreak, and now ABC News chief health and medical editor, said "There is nothing to prevent someone traveling here asymptomatically during the incubation period." Then once ill, the person can easily infect many others, who in turn spread the virus further. CDC has recently been under fire for mishandling deadly pathogens, including smallpox and anthrax. Yet Dr. Thomas Frieden, CDC director, told reporters on July 31 that Ebola spread in the U.S. is "not in the cards." But can we rely on his opinion that risk to Americans is low? If risk is so low for the US, why is CDC quietly setting up Ebola Quarantine Centers in 20 cities across the USA? Why did the Congressional Record report that Ebola Bio kits have been deployed to National Guard units in all 50 states? Experts agree that we don't know all there is to know about Ebola's methods of spread. Border Patrol sources repeatedly warn that we do not know who is coming across our southern borders, all the countries of origin, what diseases they may carry, or where they go after being released with a summons to appear months later in court. Agents report we are apprehending only about three to five percent of the total illegal border crossers now. There are too many unknowns. There is too much information being actively suppressed by this Administration and the politically appointed heads of DHS, HHS, CDC, ICE and other agencies. Americans have a right to straight talk about risks. Americans deserve a government focused FIRST on protecting the health and safety of American citizens. Reckless disregard for health is not humane.